Manayi, A., Saeidnia, S. (2015). A concern on phthalate pollution of herbal extracts/medicines and detection methods. Research Journal of Pharmacognosy, 2(3), 49-54. A. Manayi; S. Saeidnia. "A concern on phthalate pollution of herbal extracts/medicines and detection methods". Research Journal of Pharmacognosy, 2, 3, 2015, 49-54. Manayi, A., Saeidnia, S. (2015). 'A concern on phthalate pollution of herbal extracts/medicines and detection methods', Research Journal of Pharmacognosy, 2(3), pp. 49-54. Manayi, A., Saeidnia, S. A concern on phthalate pollution of herbal extracts/medicines and detection methods. 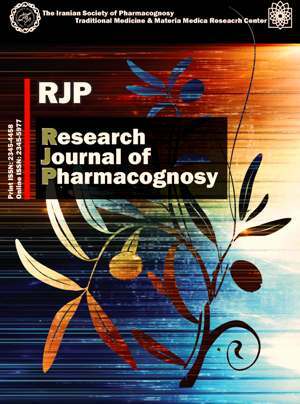 Research Journal of Pharmacognosy, 2015; 2(3): 49-54. Esters of phthalates, mainly applied as plasticizer, cause several human health and environment hazards. Phthalates are widely used in pharmaceutical products, cosmetics, as well as other plastic commercial products, and can penetrate in foods, water dusts, and air leading to ingestion and inhalation exposure followed by skin absorption for human. These compounds cause serious adverse effects on human health like destroying the endocrine system, and consequently developmental alterations and reproductive changes through induction of inflammation and oxidative stress. Some phthalates are able to bio-accumulate in water and have been isolated from aquatic organisms. Mammals and birds may be influenced by these compounds through food chain. Therefore, simple and rapid method for identification and quantification of these compounds is a debate especially for developing countries. Gas Chromatography-Mass Spectroscopy has been successfully employed to determine and measure these compounds in volatile fractions of the plant or the algal materials without more essential chemical reactions. In this article, a rapid review on phthalate toxicity and related analysis methods to detect them in herbal extracts is presented. The Lowell Center for Sustainable Production at the University of Massachusetts. Phthalates and their alternatives: health and environmental concerns. Massachusetts: University of Massachusetts Lowell, 2011. Saeidnia S. Phthalate. In: Wexler P. (Ed), Encyclopedia of Toxicology. 3rd Edition, London: Elsevier, 2014. Rudel R, Perovich L. Endocrine disrupting chemicals in indoor and outdoor air. Atmos Environ. 2008; 43: 170-181. Saeidnia S, Abdollahi A. Are medicinal plants polluted to phthalates? Daru J Pharm Sci. 2013; 21: 43. Ferguson KK, Cantonwine DE, Rivera-González LO, Loch-Caruso R, Mukherjee B, Anzalota Del Toro LV, Jiménez-Vélez B, Calafat AM, Ye X, Alshawabkeh AN, Cordero JF, Meeker JD. Urinary phthalate metabolite associations with biomarkers of inﬂammation and oxidative stress across pregnancy in Puerto Rico. Environ Sci Technol. 2014; 48: 7018-7025. Wu Z, Zhang X, Wu X, Shen G, Du Q, Mo C. Uptake of di(2-ethylhexyl) phthalate (DEHP) by the plant Benincasa hispida and its use for lowering DEHP content of intercropped vegetables. J Agric Food Chem. 2013; 61: 5220-5225. Du QZ, Fu XW, Xia HL. Uptake of di-(2-ethylhexyl) phthalate from plastic mulch film by vegetable plants. Food Addit Contam Part A. 2009; 26(9): 1325-1329. Zeng F, Cui K, Xie Z, Wu L, Luo D, Chen L, Lin Y, Liu M, Sun G. Distribution of phthalate esters in urban soils of subtropical city, Guangzhou, China. J Hazard Mater. 2009; 164: 1171-1178. Schecter A. Phthalates: human exposure and related health eﬀects. In: Meeker JD and Ferguson KK, 3rd Ed. Dioxins and health: including other persistent organic pollutants and endocrine disruptors. Hoboken: John Wiley & Sons, Inc., 2012. Swan SH. Environmental phthalate exposure in relation to reproductive outcomes and other health endpoints in humans. Environ Res. 2008; 108 (2): 177-184. Weuve J, Hauser R, Calafat AM, Missmer SA, Wise LA. Association of exposure to phthalates with endometriosis and uterine leiomyomata: ﬁndings from NHANES, 1999-2004. Environ Health Perspect. 2010; 118 (6): 825-832. Walter J, Crinnion ND. Toxic effects of the easily avoidable phthalates and parabens. Alt Med Rev. 2012; 15: 190-196. Zhou D, Wang H, Zhang J. Di-n-butyl phthalate (DBP) exposure induces oxidative stress in epididymis of adult rats. Toxicol Ind Health. 2011; 27: 65-71. Ferguson KK, Loch-Caruso R, Meeker JD. Urinary phthalate metabolites in relation to biomarkers of inﬂammation and oxidative stress: NHANES 1999-2006. Environ Res. 2011; 111(5): 718-726. Ferguson KK, Loch-Caruso R, Meeker JD. Exploration of oxidative stress and inflammatory markers in relation to urinary phthalate metabolites: NHANES 1999-2006. Environ Sci Technol. 2012; 46(1): 477-485. Wenzl T. Methods for the determination of phthalates in food. European Commission Joint Belgium: Research Centre Institute for Reference Materials and Measurements; available from: http://www.bezpecnostpotravin.cz/UserFiles/File/Publikace/ftalaty.pdf‎. Appendix A to part 136; methods for organic chemical analysis of municipal and industrial wastewater. Available from: http://water.epa.gov/scitech/methods/cwa/organics/upload/2007_07_10_methods_method_organics_606.pdf. Rastogi SC, Jensen GH, Worsøe IM. Compliance testing of phthalates in toys, Analytical chemical control of chemical substances and products. Denmark: National Environmental Research Institute Ministry of the Environment, 2003. Firouzi J, Gohari AR, Rustaiyan A, Larijani K, Saeidnia S. Composition of the essential oil of Nizamuddinia zanardinii, a brown alga collected from Oman Gulf. J Essent Oil Bear Pl. 2013; 16: 689-692.